The 2017 Dutch Tea Championship has concluded. As detailed in my last post, 14 contestants entered the preliminary rounds which included a submission video, written test, live tea preparation, and 20 blind tastings. After, there were four contestants left to compete in the finals. These finalists faced off on March 12 for the final prize. Their competitive rounds consisted of 17 more blind tastings, including a blind preparation, and a live tea presentation to be paired with a gourmet dish created by Jan Smink, one of the judges and the head chef of De Librije, a gourmet hotel and restaurant. Before we get there, let’s talk about what actually happened at the event, in a conclusive attempt to understand a professional tea competition. The tea competition is held by the International Tea & Coffee Academy and took place at the Amsterdam Coffee Festival, a popular gathering for industry people and spectators alike. The crowds formed, educators from the ITC gave out tea samples, and the finalists prepared their materials. Remember, there were four competitors left: Charlotte van de Ven, Jozefien Muylle, Mark van den Bogaart, and Pieter Bas Prins, waiting to embark on the challenging feats ahead. From left: Mark van den Bogaart, Pieter Bas Prins, Charlotte van de Ven, and Jozefien Muylle. Round 1, Blind Preparation: Just before the event began, the finalists were given two mystery teas. They had to quickly identify what the two teas were and, within 8 minutes, brew them to the best of their ability to serve to the judges. Each brought their own tools to work with. What teas were sourced for the challenge? Tea #1 was a Dian Hong Jinzhen (Yunnan Red Golden Needle) from Lincang, sourced by the Dutch company Simon Levelt. Tea #2 was a first flush white tea from Glenburn Tea Estate in Darjeeling. Round 2, Blind Tasting: The finalists were given five sets of three teas. In each set of three, two of the teas were exactly the same, and the third was very similar in aroma and flavor. Black cups were used to rule out judging by the appearance of the tea. For each set, the finalists had to chose which tea was different. Round 3, Tea & Food Pairing with Presentation: The final round was a challenge of the finalist’s tea pairing and preparation skills. Given an initial tasting and weeks to prepare, this test would allow them to select, once again, a tea in an attempt to impress the judges. Only this time, the tea needed to accentuate or complement a refined amuse-bouche. A good deal of analysis and preparation must go into the tea and food pairing section, as it functions not only as a way to brew the tea for pairing, but as a sort of solo performance, with the finalist working alone on stage with the selected tea and selected teaware. The dish to be paired, at left, was a purée of celeriac, with pickled vegetables, zorri cress, an emulsion of fermented garlic, a wedge of brioche bread with brown butter, and a salted crisp of colostrum (the first milk after the birth of a calf). Charlotte chose a Hawai’ian white tea; a blend of multiple cultivars, including traditional Japanese Yabukita and Yutakamidori. She brewed it fairly hot in multiple small glass teapots and served it from a crystal decanter. She said the sweetness it imparted balanced the flavors and the faint finish of anise paired with the light aniseed note of the dish. Jozefien selected a second Taiwanese oolong, after choosing a Taiwanese Tie Guan Yin for her preliminaries. This time she chose a GABA oolong from Nantou. She prepared the tea in a clay kyusu teapot and noted that the additional GABA amino acids complimented the fermented vegetables and gave the pairing a truffle-like flavor. Mark brewed a traditional Da Hong Pao oolong from the Wuyi Mountains. He brewed the tea in a Gongfu style Yixing teapot and stacked multiple steepings into wine glasses for the judges. The tea, he said, emphasized the fermented elements in the dish and the dish, in turn, emphasized the richness of the tea. Pieter prepared a 25-year aged Lu’an heicha. Though his preparation in a Gongfu style Yixing pot was simple, he outfitted his teaboard with natural aesthetics; sand, moss, and rocks. He said the fermented tea would stimulate your appetite and pair with the sweet/sour aspect of the dish. All of this was carefully noted, studied, and processed by the judges. After deliberation, they came to a decision. In September, Jozefien will be whisked away to Darjeeling and Assam to visit tea estates and learn more about their teas and production methods. She also becomes the ambassador for the ITC and the Flemish Tea Academy. I caught up with Jozefien to ask her a few questions about her experience. ‪Tell me about your company, Be Your Tea. Be Your Tea was launched in November 2015 with a primary focus on bringing top tea to tea lovers in Belgium and The Netherlands, by curating and providing good tea and background information. Our tagline is “pure flavor, pure joy” which will always be in the heart of our small company. Besides that, I offer workshops, degustations, and trainings to meet the demand for basic and specific knowledge and expertise. Each year, I select teas from local and ecologically driven farmers. Since we work with a limited selection of teas, we have to explain our clients that running out of stock is something very natural. During my trip the focus is on gaining a better understanding of how tea families produce their tea. I take samples and order from the ones I got a good understanding with. What tea did you choose for the finals, and why? Unintentionally, I selected a Taiwanese oolong twice, but with a different flavor profile. Considering the finals, the GABA oolong appeared to me as the best match after pairing the dish, after choosing between a total 7 teas I had in mind. The GABA oolong is a tea with an outspoken flavor as the result of a specific production process and it has undoubted gastronomical appeal […] the tea has a playful effect on the various ingredients. I reached out to previous champions for counseling and advice. I’m thankful for their instructions and support. Besides that, I prepared by tasting and studying and by putting it into practice via tea advice for the restaurants I serve. Giving a proper presentation at the championship in the limited time of 6 minutes was an exercise in focus and presentation skills. 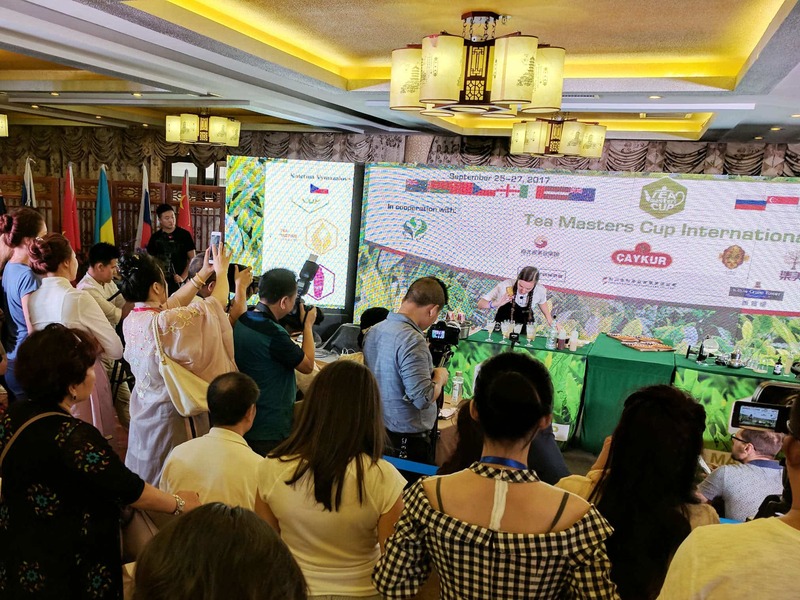 This 2017 competition was a serious challenge, partly due to the additional requirement of the tea and food pairing on top of the cupping and the steeping of an unknown tea. Since I am rather busy with my part-time job as an art organizer, building up our company, and of course taking care of my children and family, I was limited in time. How challenging was the blind tasting, since this isn’t typically a part of tea training? I consider blind tasting an essential aspect of my profession. Blind tasting requires, in my opinion, a serious amount of training with a wide variety of teas of all grades to be experienced, some talent, and a bit of luck. The blind tasting was very tough for all of us. Traveling to tea producing countries not only permits me to purchase the wonderful tea I am looking for, it broadens also my repertoire of flavors and links flavors to specific experiences, permitting me to cross reference on a sensory level. Put differently, blind tasting is the part of the profession that keeps you humble, since there is still so much to learn. What do you plan to do now that you’ve won? I see it as my calling to promote tea as a serious product of gastronomical level by providing inspirational sessions. More specifically, I’d rather focus on challenging people to discover the rich diversity and complexity of flavors inherent in tea. On a personal level, it is my ambition to engage in a closer collaboration with chefs around tea and food pairing. I hope to be a part of many tea adventures and to learn a lot from the many experienced tea professionals I am going to meet. I look forward to visiting the regions of Darjeeling and Assam with Origin Trips in September. Feel like you have what it takes to compete? Perhaps we’ll see you next year! *Photos from ITC Academy and Jozefien Muylle.